Europeans ( with the exception of Akhal Teke experts, of course!) 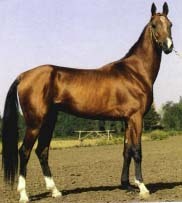 have difficulty in understanding the Akhal Teke horse's conformation because it is unlike European horses. The horse does not carry much body fat; this is termed "dry". 1) Head: light, dry with wide cheeks, profile straight or convex depending on the breeding line. Can also be dished. 2) Eyes large and expressive favouring a hooded eye, called a Mongolian eye. 4) Lips and nostrils thin, delicate small, the head is sometimes small in proportion. 5) Long neck set high on the shoulders. Latch, narrow at junction between head and neck. 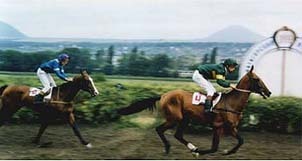 6) Withers long and well muscled. 7) Back and loin long and straight. 8) Croup wide and long with a slight sloping angle. 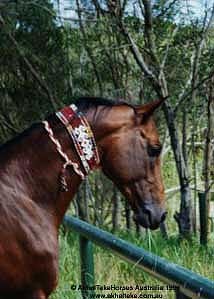 9) The tail, set low and should have sparse hair growth (desired) and can be carried high, if a horse is aroused, like an Arabian horse's tail. This tail carriage is not unique to an Arabian. 10) Shoulders, long shoulder, very good slope. 11) Legs, long, dry, strong bone clearly defined. 12) Pasterns, long and elastic. 13) Chest, often narrow depending on breeding line. 14) Hooves, small and hard, very strong fetlock. 15) Minimal forelock and mane. 16) Hair growth fine, often iridescent in the sunlight, does grow a winter coat, summer hair very thin. 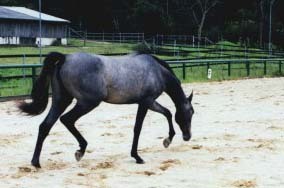 Athletic, elastic gate, low flat trot, described as "snake like trot." Excellent for long treks, war raids and endurance. 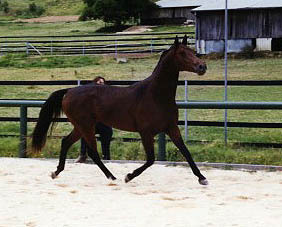 Photo demonstrating smooth movements of the Akhal Teke. 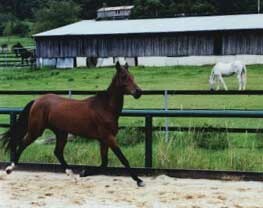 The horse appears more flexible than other breeds, hence the term "elastic" gaits.  Arabian third over set distances. 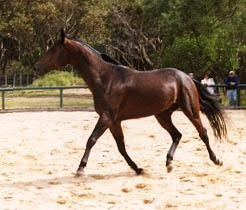 Graceful, alert horse with high head carriage, long neck, long ears, thin skin and a very fine silky coat with iridescent sheen. Very hardy horse, frugal in its eating habits, an elastic gait, a very athletic horse, an equine aristocrat. Known in Central Asia and China as the "Heavenly Horses." 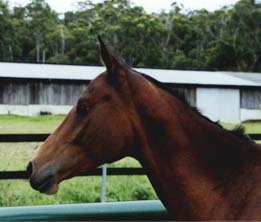 Photo from "Encyclopaedia of the Horse"
© Elwyn Hartley Edwards, RD press1994.